Right out of the box, I knew there would be some changes from the original Skylanders game based on the portal of powers. Unlike last year, when the PC and Xbox 360 versions were wired and the PS3 and Wii versions were wireless (via USB wireless transmitter), all four starter packs this year were shipped with a wired Portal of Power. We reached out to Activision for comment, but I suspect it is due to so many wireless Portal of Powers from the original Skylanders being in the wild and fully compatible with the Giants version (not to mention cost savings). Another change related to the Portal is that the starter packs are sold in two versions, one with the portal and three figures (including the Giant Tree Rex, new Jet-Vac and Series 2 of Cynder) for $74.99 and one for existing portal owners that includes only the Giant Tree Rex and the game for $59.99. At first glance, the cheaper option (for those that already have a portal) looks like the best value, but considering that most Skylanders figures are $8-$15 and you end up getting a backup Portal of Power, another Starter pack may actually be a good thing in the long run. 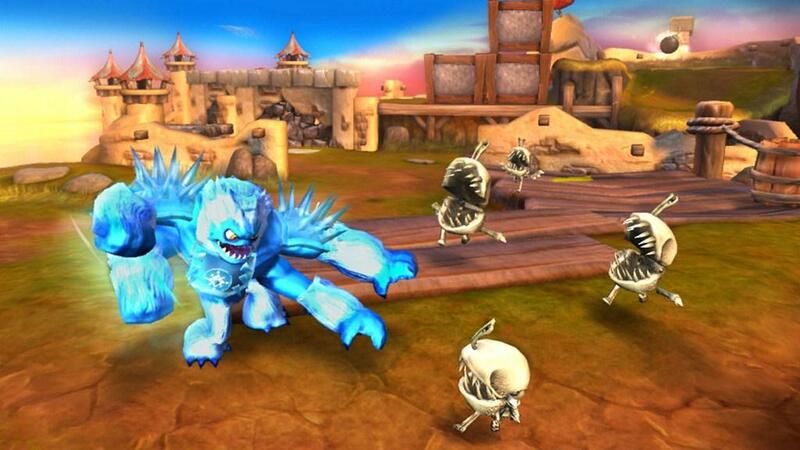 One other cool add-on with Skylanders: Giants is the introduction of the Lightcore technology. This little bit of bling illuminates a few spots on compatible Skylanders figurines (initially set for all of the Giants and one Skylander from each element) when they are placed on the Portal of Power. While the Lightcore technology is more for show than anything, it still looks pretty cool and the kids love it, which means it will probably come with a premium price versus the non-Lightcore tech figures. Now that I have had a chance to spend some quality time with it, Skylanders: Giants looks to be following the same path as the original game, but in a much more refined manner. There are actually less chapters than the original game, but there are more exportable areas and the challenges, battle arenas and upgrades are much more plentiful. Even the in-game menus system has been refreshed and updated to reflect a game that is making itself better. Because Skylanders is so much more than just a video game, I wanted to step aside and talk about the collectible figurines before the game itself. With Skylanders: Giants, we will be introduced to 16 new Skylanders consisting of one Giant and one Skylander for each of the eight elements. In addition, the eight new Skylanders will also have a Lightcore version available to collect as well as 24 Series 2 versions of the original Skylanders figurines. All of the Series 2 figurines have an orange base (including Giants and Lightcore figurines), and in the case of the reissued ones from the original, have different looks to the figurines as well. This will help easily tell whether you have your Series 1 (green base) or series 2 (orange base) when you reach into your collection for a new Skylander. If I had any disappointment with Skylanders: Giants, the redistribution of so many Series 1 characters as Series 2 would probably be it. I would have liked to see more than just 16 new figurines (Giants and Skylanders) be available, as paying for Series 2 figurines with small changes to their design to reflect the upgrades doesn’t seem like a wise investment of my dollar. Especially since your original Series 1 figures work just fine with Giants and they have access to the extended Level 15 cap and weapon upgrades just like the series 2 figurines. In fact, there are plenty of Skylander series 1 figurines and starter packs still for sale (many at a discount), so it is not that difficult to pick up a wireless portal or extra elemental figurine to get you through the entire game and those element specific areas. Although I am sure we may see more Skylanders get released in the future (probably as part of Adventure Packs), it does help the initial strain on the wallet by allowing any previous Skylander character to be playable while slowly collecting the series 2 to spread out the financial hit over holidays and future birthdays. The story of Skylanders: Giants focuses on the ancient Giants that were separated from the rest of the Skylanders and banished to Earth thousands of years ago. 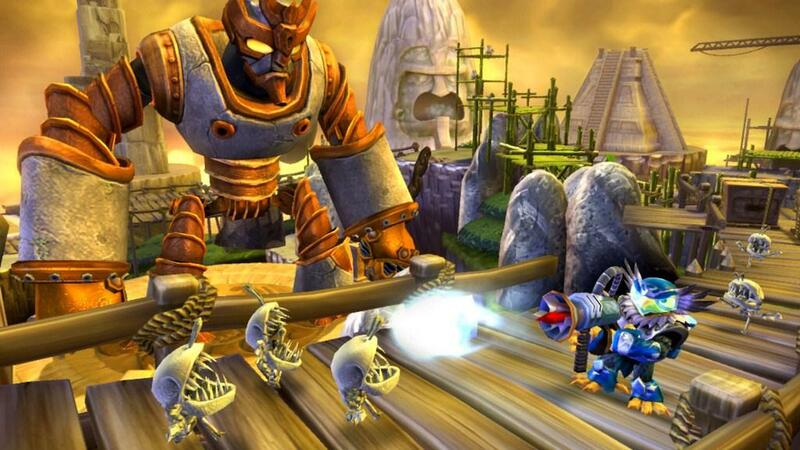 With KAOS on the loose, the Giants are needed to pair with the Skylanders to work through the games 16 chapters. As you start the game, you will recognize that a lot of the old faces are back (if you played the original) led by Flynn the Balloonist (voiced by Patrick Warburton of Family Guy and Seinfeld fame), Persephone and Cali. Fortunately, they have toned down the rhetoric a bit and given the option to skip almost all interactions with NPCs and cut scenes so you won’t have to endure the redundant dialogue. Another change is that in Giants, the in-game centralized area where you can access the store, upgrades, go into the battle ring or do heroic challenges is now on Flynn’s flying ship instead of the grounded Ruins. So the deeper you get into the game, the more crowded Flynn’s ship becomes. In a weird twist, quite a few of the bosses you defeat end up on Flynn’ ship as your point of contact to access things like Skystones game (a tile-based card game) in the Game Room or the battle arena. Like Skylanders: Spyro’s Adventure, you can complete the entire campaign mode with the three included Skylanders in the starter pack, but you will miss out on a lot of the areas. It is best to have at least one of every element available in order to get all of the loot drops, hats, treasure, scrolls and such. As for the Giants, they are “needed” to complete specific tasks and areas of the game, but the developers did leave other options (such as finding a bomb, or winning a hand of Skystones) to accomplish the same task a Giant is needed for the deeper you get into the game. Frankly, this is a good thing, as you can easily kill off your Skylander Giant during a tough battle and have to wait for it to recover in order to proceed. Overall, the campaign mode is fun, engaging and keeps you on your toes looking for hidden areas, treasures or items. The storyline and dialogue is still top notch, with a lot of the annoyances from the original game (too much of the same catch phrases) weeded out. There are actually three levels of difficulty at the outset, so you can tailor-make the game to the level of you or your children’s skill and Skylanders talent. I played mostly on medium, but switched a few times and the difficulty does follow the name of each level. As I mentioned before, the campaign has a little something for everyone and if you enjoyed the original Skylanders, you will really like Skylanders: Giants. Other than the story mode, the game offers a couple of extra modes to help build up your character or play a little PvP with your buddy. In the Battle Arena, one of the previous boss battle losers (Brock) gives you the chance to fight in a variety of arenas (they are also able to be purchased in game with your loot drops.) Each Arena has several different challenge type battles that will earn you progressively higher rewards as you complete each one. Anyone that is a fan of “horde mode”, this is your guy, as wave after wave of NPCs come after you based on the challenge type and difficulty you are playing on. I personally like the arena battles as a way to build my characters skills and learn how to best use the weapons and limitations of each character. Another mode is the Battle Mode, which is essentially PvP action in a one-on-one setting. There are four options, including Arena Rumble, Skygoals, Skygem Master and Ring Out, with each one having a specific goal to win. 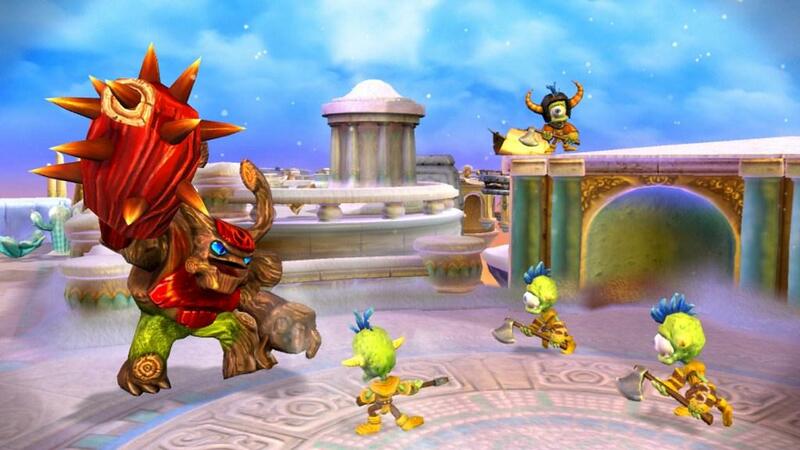 One upgrade from the original Skylanders is that each option can be played in any one of the four arenas (Sunrise Towers, Lockdown Islands, Wheel of Power and Slime Pipe). The Co-Op mode is just the Story mode, playing locally with one of your friends and I am ok with that. Sometimes stepping back (especially with the targeted audience) and keeping it simple is a great formula to make a game a success. At some point in the series, Toys for Bob may update it to allow play across the internet, but for now this seems sufficient because part of the charm of the Skylanders concept is the physical collection of toys that you want to share and show off. Unlike last year when I braved four different versions of the original Skylanders, I only took on the Xbox 360 version for the main review and the Wii version as a secondary review. With a year of development under their belts, it appears that Toys for Bob was able to tailor the game better to the more advanced consoles (PS3 and Xbox 360), something I think may have been lacking last year when the game was ported from the Wii version. While you have been reading primarily about the Xbox 360 version, here is a brief synopsis of the Wii version and a link to impression of the PlayStation 3 version that Jeremy and his daughter are currently enjoying. Although I spent most of my time with the Xbox 360 version, I turned my Six and 10 year old kids loose on the Wii version. Between the two of them, they probably logged close to 100 hours of gameplay in the original Wii version, so what better way to get a feel for a sequel than to watch, learn and listen to a couple of experts on the game. I also jumped in from time to time to get a feel for the controls, which I suspected would be the biggest difference between the Xbox 360 version and the Wii version. After several hours of game play, it was easy to see that the Wii version is graphically not quite to the level of the Xbox 360 version of the game. Although we expected the graphics and control scheme (making use of the Wii remote) as no-brainer differences, my kids and I also noticed that the Xbox 360 version not only looks better but plays faster. What I mean (and I mentioned above about tailoring the game to the different consoles) is that the superior hardware in the Xbox 360 is being used to load areas in the game quicker and the action just seems to be smoother. Although I would expect this with the difference in hardware between the two machines, I don’t remember it being as noticeable in the original Skylanders, leading to the conclusion that the game is now taking better advantage of the hardware than last year. As for comparing the Wii version of Giants to the original Skylanders, I did notice improvement in the way the controls worked and responded on the Wii’s analog stick. 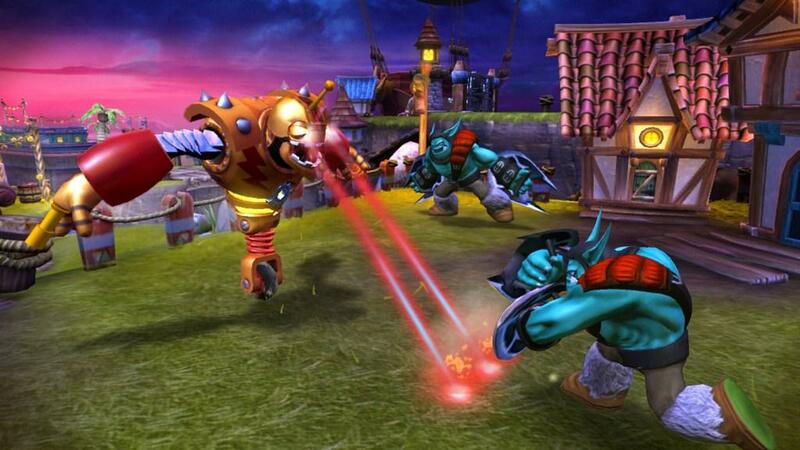 In the original Skylanders, I noted a lack of responsiveness that the PS3 and Xbox 36 versions didn’t experience, and that seemed to have been adjusted and taken care of. Also, something I mentioned above as a positive for the Wii is that I actually prefer the way the Wii version is coded to use the remote to engage keys, open hat boxes and chests. With the Xbox 360 version, you just button mash (it is the ‘Y’ button) which takes a bit of the game play experience away. Realistically, the Wii version is not much different from the other console versions, but if I was rating it, I would give the Wii version a point lower after taking into account the effect of the negatives and positives mentioned above versus the Xbox 360 version. 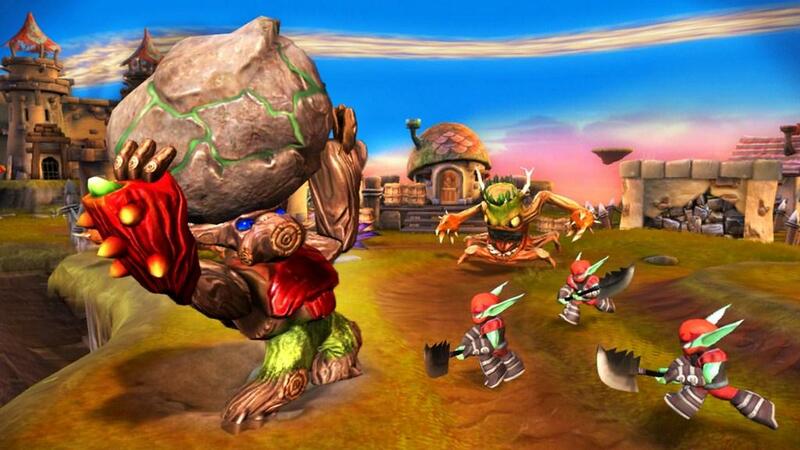 Jeremy had access to the PS3 version of Skylanders: Giants and you can read his impressions here. I have to say, the folks at Toys for Bob released Skylanders: Giants and have hooked me (and my kids) in again this year. I wasn’t sure that a sequel would get me excited for the game and collectibles, but it really has. I was pleased to see that they took a relatively good thing and made it even better, as they from a couple of missteps with the original Skylanders game and smoothed everything over. What resulted is a simple, yet refined and addictive game that appeals to the gamer and natural collector in kids of all ages. Many of the issues I had with the original Skylanders have been addressed and the only thing I am really questioning at this point is the re-release of so many Series 1 Skylanders for Giants. Other than that, Skylanders: Giants has exceeded the original game and should be a must-have on any gamers Holiday list. The folks at Toys for Bob took the hottest selling game/toy crossover from last year and have made it better. Skylanders: Giants is a more refined experience that offers a little bit of something for every type of player, including sucking me back in to enjoy some quality gaming time with my children in the co-op mode. Although I wish the figurine lineup had more than 16 new characters being introduced, I still expect retailer shelves to be stocked to the brim with all of the merchandise this Holiday Season. For those that already have invested heavily in Skylanders, this is a no-brainer and must have. For anyone new to the franchise, the games charm and ability to satisfy gamers of all ages and skill set make this something you should look into.